Some European rail tickets must be validated prior travel. Passengers travelling with unvalidated tickets may be subject to a fine. You will find ticket validation machines at the entrance to the platform area or on the platform itself. All French train tickets (except print-at-home tickets) must be validated before boarding the train. There are small yellow “compost” or “automat” machines marked Compostez votre billet. These can be found at the entrance to the platform area or on the platform itself. Simply present your ticket into the slot and wait for the machine to stamp them, the date and validation code will appear on the reverse of the ticket. Travellers who board the train without validating their ticket may be subject to a fine on board the train. Italian train tickets (except print-at-home or "paperless" reservations) must be validated before boarding the train. 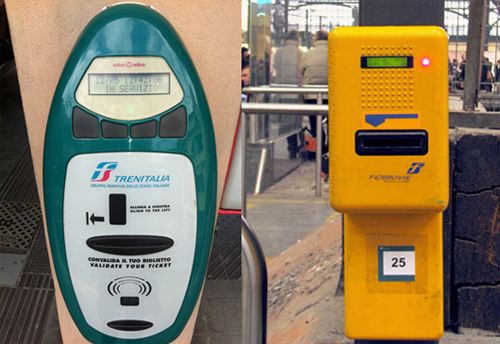 There are small yellow or green machines at the entrance to each platform marked Convalida il tuo biglietto. 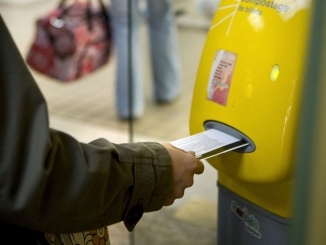 Simply present your ticket into the slot and wait for the machine to stamp them, the date and validation code will appear on the reverse of the ticket.